It was on March 12, 1947 that the first car to wear the now famous Ferrari badge was fired up and driven out of the factory in Maranello, Italy. On Sunday, exactly 70 years later, Ferrari kicked off its official celebrations for this milestone anniversary with a reenactment of that historic day. Ferrari’s first car was the 125 S bearing chassis number 01C. It wasn’t the first car from Ferrari founder Enzo Ferrari, however. That honor goes to the 1940 Auto Avio Costruzioni 815. As for the 125 S, the car lacked a body for its initial test drive but just two months later it would be competing in its first race. The track debut took place on May 11, 1947 at the Piacenza Circuit. Franco Cortese was behind the wheel and was in the lead when a faulty fuel pump ended the outing prematurely. Cortese would then drive the car to its first victory just nine days later at the Rome Grand Prix. The 125 S would eventually go on to rack up five more wins that year, the most notable being Tazio Nuvolari’s win at the Parma Grand Prix. 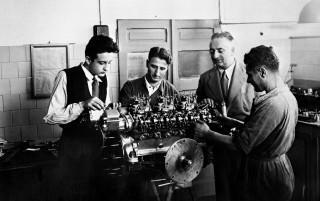 Ferrari built just two examples of the 125 S. Both were powered by a 1.5-liter V-12 designed by Gioacchino Colombo with help from Giuseppe Busso and Luigi Bazzi. Controversy surrounds the fate of the two cars as both were modified and sold as later models. It’s believed chassis 01C was resold as a 1948 166 Spider Corsa bearing the new chassis 010I. The car’s current owner in 1987 had it restored to its 125 S shape, as shown here. Ferrari plans to host anniversary celebrations in 60 countries. The LaFerrari Aperta special edition will be present at each stage as the symbol of the 70th anniversary, as will a number of cars featuring special liveries inspired important milestones of Ferrari’s history. The celebrations, which will culminate on the weekend starting September 9 in Maranello, can be followed via the website www.ferrari70.com.